Comfort meets character in these sharply designed rooms where guests can choose from a relaxed modern style or rich history in these 100 guestrooms which include nine suites. 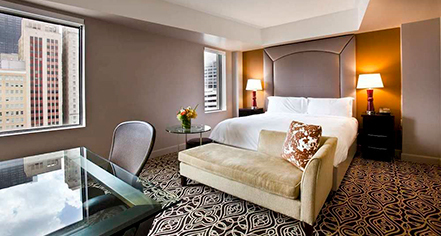 Guests can sleep like royalty at The Sam Houston Hotel featuring king-size beds or the option of two double-size beds. 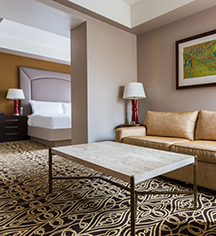 Guestrooms include comforts such as chaise lounge, luxurious linens, and well-lit work area. 1 King Bed: Guests can enjoy a good book on the chaise lounge and sleep soundly in luxurious linens in this elegantly appointed room. 1 King Bed Deluxe Room: Comfort meets practicality with luxurious linens, well-lit workspace, and a Herman Miller ergonomic chair. 2 Double Beds: Space is efficiently arranged to afford guests luxury and comfort. 1 King Bed, 1 Bedroom Suite: This room features a private parlor with a sofa, supple leather chairs, and a well-lit work desk with a Herman Miller ergonomic chair. 1 King Bed, 2 Bathroom Suite: With two separate, full bathrooms, up to four guests can stretch out comfortably in one of these Premier Suites.